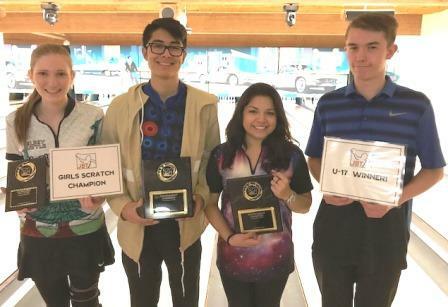 Cortez Schenck successfully invaded the northwest, while Hilari Zuniga won her first title, in an exciting conclusion to the JBT Pac Northwest Conference's regular season at Triangle Bowl in Longview. Kelsey Abrahamsen, trying to stay within shouting distance in the Bowler of the Year race, began the stepladder finals with a 238-165 win over Chris Tuholski. She then beat fellow veteran Tyler Boe in an exciting 241-225 game. Jake Mullen then stopped Abrahamsen 239-194 to advance to the title game. Top seed Schenck makes occasional trips to the northwest to showcase his talents there, and crushed the pattern en route to the #1 spot. Mullen has been throwing the ball great in his quest to finally win a scratch title, but Cortez was just too tough in this game, winning the match 234-205, good for the 90th title of his unparalleled JBT career. Alejandro Moser-Hernandez began a climb up the handicap stepladder with a 189-163 win over Vincent Oberto. Alejandro then stopped points leader Tyler Coates 211-198. Newcomer Hilary Zuniga then beat Moser-Hernandez 219-208 to move on to the title game. Top seed Bradley Baltazar continued his excellent bowling this season by earning the #1 spot, but had a lot of pins to make up against Zuniga, who hadn't ever bowled competitively before meeting Boe, her boyfriend. As often happens, despite the handicap disparity the match got close at the end, and Hilary had just enough for a 205-197 win and her first career JBT title. Abrahamsen regrouped to win the day's Girls Scratch title with a 205-172 win over Brooke Collins. Mullen also was assuaged with a U-17 win, 217-148 over Baltazar. Thanks as always to everyone at Triangle for their great hosting job. The field is now set for the Pac NW Invitational, with $1,000 top scholarships up for grabs to the talented field.